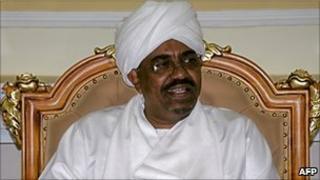 The north of Sudan will reinforce its Islamic laws if the south secedes as a result of next month's referendum, President Omar al-Bashir has said. Mr Bashir said the constitution would then be changed, making Islam the only religion, Sharia the only law and Arabic the only official language. Correspondents say his comments are likely to alarm thousands of non-Muslim southerners living in the north. They are currently protected from some of the stronger aspects of Sharia. "If south Sudan secedes, we will change the constitution," Mr Bashir told a gathering of his supporters in the eastern town of Gederef on Sunday. "Sharia and Islam will be the main source for the constitution, Islam the official religion and Arabic the official language," the president added. The imposition of Sharia on the non-Muslim south was one of the reasons for the long civil war, which ended when a peace deal was signed in 2005, the BBC's James Copnall in Khartoum reports. Under the accord, an interim constitution was drafted that removed Sharia law from the south and also recognised Sudan's cultural and social diversity, our correspondent says. Senior northern officials are just starting to acknowledge publicly that South Sudan - where most people follow traditional beliefs and Christianity - are almost certain to choose to separate in the referendum. Separately, Mr Bashir also commented on a recent high-profile case in which a video posted on the internet showed a woman being flogged by police in the north. "If she is lashed according to Sharia law, there is no investigation. Why are some people ashamed? This is Sharia," the president said. Human rights activists have accused the police of treating the woman in a particularly brutal way not compatible with Islam.